The CDH-7X series has been discontinued. Please see the CDH-7021 as possible alternative or contact our Flow Engineering department. 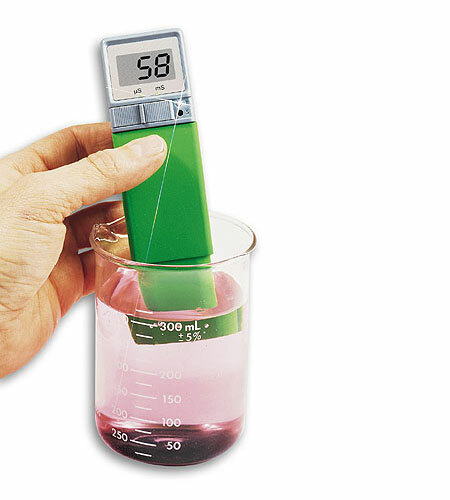 Pocket-sized, digital conductivity meter offers a variety of measuring ranges in one model. Ideal for quick field checks of water-based solutions, the CDH-7X combines the measuring sensor and meter in one compact, pocket-size package. It measures ranges of 0 to 199 µS/cm, 0.0 to 1.99 mS/cm, 0.0 to 19.9 mS/cm, 0 to 199 ppm, 0.0 to 1.99 ppt and 0.0 to 19.9 ppt, with ATC 0 to 70°C (32 to 158°F). 참고: Includes batteries and operator’s manual.